We have got you the go in bingo so you can literally just walk off with your smartphone or tablet and play bingo anywhere and anytime you, please. Although it is fairly a recent phenomenon, many casinos and bingo sites have embraced the fact that many of their players don’t want to be shut away at home and instead want to have access to their favourite games wherever they are. 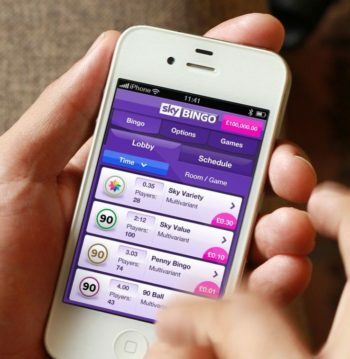 If you are out and about, fret no more, as we have scoured the World Wide Web to find you the best online bingo mobile apps with the biggest names out there. You only need to whip out your phone and play mobile bingo. Most importantly, we have made sure that the apps promoted in this article work on all mobile devices and tablets, regardless of whether you have an Android or an iOS device. After all, who would want to miss out on a game or some time-limited promotion? This is a great bingo app for Android and iPhone with a £60 free newbie bonus and daily bingo jackpot prizes. The look of the mobile variation of the website is not very crowded and you can pretty much access anything like bonuses, bingo games, slots and casino games from their home page. The platform is compatible with many devices and has a huge range of bingo tickets, a user-friendly layout, and polished interface and many promos and other capabilities. 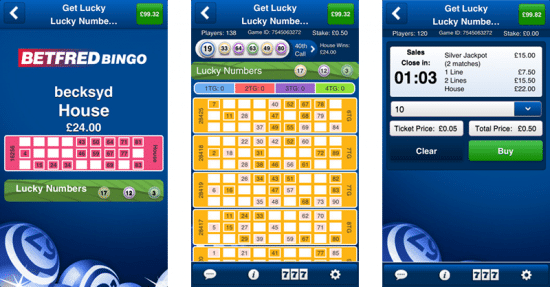 Τhe newest Bingo Gala app included a greatly anticipated user layout and optimised gameplay. You can select from many bingo lobbies and enjoy some slot games as well. You can pre-purchase the tickets for all bingo games and play bingo whenever you fancy. 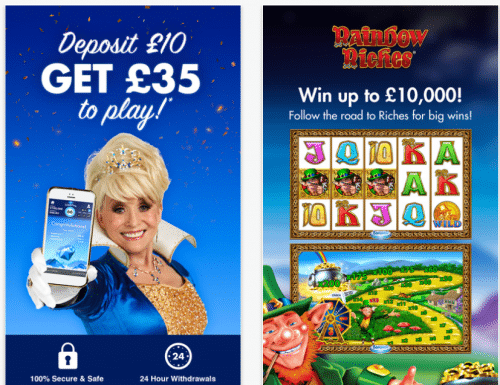 You can access Betfred Bingo through mobile as well and enjoy all the greatest bingo games, as well as an incredible variety of slot games inspired by T.V themes like Britain’s, got talent and Cleopatra’s chest. The games, of course, are fully supported for mobile access. Players can enter the Betfred app through the mobile browser of their mobile device or tablet or alternatively download the app for Iphone or Ipad which allows a more easy access from anywhere and anytime. Betfred Bingo’s mobile option features the same games you would find in the P.C version like Who Wants to be A Millionaire, Cash Cubes, and Rainbow Riches. The design of these games is rather simple and easy to comprehend and that makes Betfred Bingo mobile version very direct and easy to use. In general, Betfred Bingo is amazing on mobile devices but we would suggest that you use the app version because it’s faster to access the bingo room from there. You will still have to download through the rest of the Betfred apps to access the remaining games. Overall, this is a fully functional platform that has no crashes and offers a great user experience. Betfred has a committed app exclusively for their bingo area. That keeps it direct and makes it easier to use for any kind of player. The interface of the app is almost the same as Betfred Bingo area on browser version and the only difference is that the navigation tab is toward the end of the screen and at the top (on the browser version). Check out “access via mobile browser” for more info. Betfred offers another method for downloading the app to your Android device and that is by accessing the following link: betfred.com/mobile/android-mobile-bingo and follow the steps instructed. You will also need to lift certain security settings on your phone to enable the app to download properly onto your Android phone. You can also enter Jackpotjoy through a smartphone which has all the greatest bingo games and a nice variety of popular slots like Bubble, Monopoly City, and Magic Castle. Jackpotjoy has also a nice array of live and classic casino game choices. All of these games are totally optimised for mobile users. Players can sign in the platform via the mobile browser of their mobile device or tablet or download the relevant iPhone or iPad app which will enable them to sign in and play anytime from anywhere they wish. New members only, opt-in required. Min £10 deposit and wager. Spins on Double Bubble only. 30 day expiry from opt in. 18+. Rules apply. William Hill Bingo has been in operation since 2007 and has been growing more popular for its wide variety of bingo games. When it comes to the desktop version, the site boasts a vast selection of slot games as well as other gaming options including sports betting. Let us focus on the bingo app. For starters, it has a simple interface that is easy to navigate, so if you are not an app wiz, there is no need to worry as it’s easy to grasp. The app itself features some great games and features. 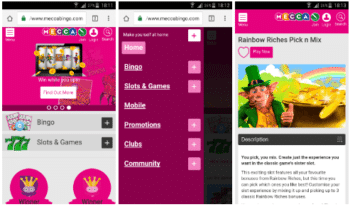 Although it is not as aesthetically pleasing as other mobile Bingo Apps, you have to take into consideration the operator’s massive reputation, the constant flow of promotions and offers and the games available each day of the week. The quality of the games and promotions is of a high standard. Sign up with our WH promo code for an account and receive a total of £50 to play with when you make a deposit of £10. Additionally, William Hill gives newcomers the chance to play and enjoy free online bingo for up to 8 days with cash prizes going as high as £3,200. 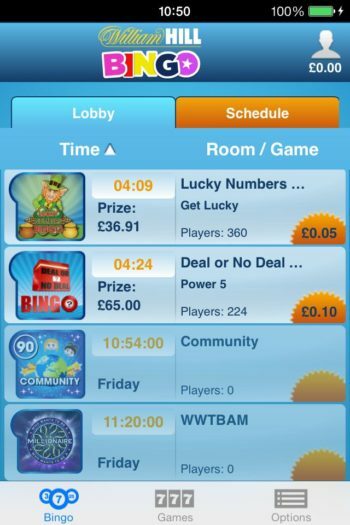 What can we say about the Tombola Bingo App? For starters, it is a real money bingo app for both Apple and Android phone and tablet users. With a name like Tombola, you know that this is a site that is specifically focused on bringing you all the bingo games and rooms without distractions from other forms of betting. It is undoubtedly one of the biggest UK sites available online, with over 40 chat rooms and 100 chat moderators working exclusively for this site. When you play on the go, you can enjoy some surprising games and jackpots at one of the friendliest sites around. If you want to play on their mobile app, you have a choice of 5 rolls with three colours available for each room so you can personalise your game. To play, you would need to download and install the Tombola Bingo Apple or Android App. You can rest assured that you will still be able to take advantage of the welcome offer, even on the go. Make a deposit of just £10 at Tombola and receive an extra £20 to play with for free. That’s a total of £30 to play your favourite online bingo game. This bingo site needs little introduction. It has been around since 2005 and has gained increasing popularity over the years due to plenty of TV marketing and promotions. The fox mascot is now almost as famous as the website itself and is so heavily featured in their promotional messages, that people automatically associate the fox with the site. Furthermore, the bingo site has won numerous awards for its mobile bingo applications so it comes as no surprise that we have listed this bingo app on our exclusive list. The Foxy Mobile app has a fun interface as you would expect from a bingo site of this calibre. Expect loads of bingo games and constant flow of promotions and offers as well. If you are new to Foxy Bingo, you will receive a £30 deposit bonus when you sign up and make a deposit of £10. That’s a total of £40 to play with. Everyone knows the name Sky and the brand behind it. Branching out in several directions, the reputation and quality boosting the Sky name is pretty evident. One such product by this brand is its bingo site. 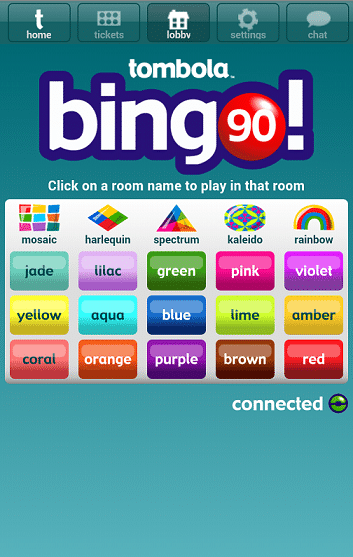 What this brand has done well is that it has created one a bingo app that is easy to comprehend and grasp. You only need to download and install it and you are ready to go. And if that wasn’t enough, Sky Bingo has an offer for its new players. Make a deposit of £5 and Sky Bingo will give you £35 in bonus cash money. That’s £40 to play with and to help you get acquainted with its bingo games. We only want to promote the very best bingo mobile apps, so we couldn’t without a doubt not mention Mecca Bingo. This UK household name is available both online and offline. You probably have been to a Mecca bingo hall at some point of your life. Their knowledge of their bingo product is second to none and the promotions they run are some of the best in the business. When you download the Mecca Bingo Mobile App, you can expect to have plenty of fun. For starters, it has a super colourful interface that is so easy to navigate around. Furthermore, their welcome offer for new sign ups is also quite generous. Make a deposit of £10 and you will get £40 in bonus cash – A total of £50 to play with. And if that is not enough, all newbies get the chance to play bingo for free for up to 7 days in the Newbie Room where cash prizes up to £20 are up for grabs.